the peeling compartment and the cycle begins when their hands are removed. The watermelon is peeled, topped and tailed, then discharged down the exit chute. 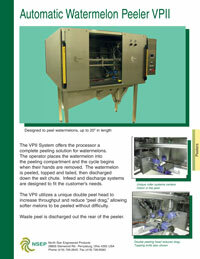 lnfeed and discharge systems are designed to fit the customer's needs. 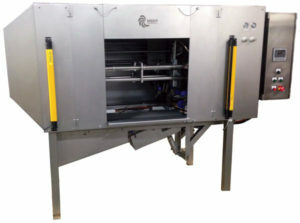 The VPII utilizes a unique double peel head to increase throughput and reduce "peel drag," allowing softer melons to be peeled without difficulty. Waste peel is discharged out the rear of the peeler. Capacity Up to 3 large melons / min. Dimensions 95" x 40" x 75"